One designer you’ve heard me mention on here time and again is Khirma Eliazov. 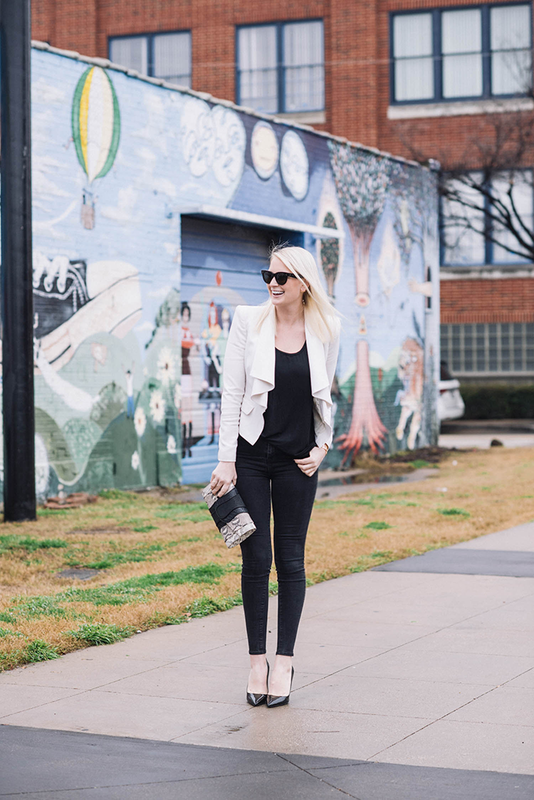 I’m a HUGE fan of her luxe and exotic handbags – you may remember this particular clutch style from this post or this post? I first learned about Khirma’s covetable clutches two years ago from my friend Lauren, who was toting one around to all the shows at New York Fashion Week. I was so intrigued by this piece that I actually followed up with Lauren after fashion week to get the name from her. I’ve been hooked ever since! Two years after my introduction to the brand (aka this season at fashion week), Khirma invited me to her West Village boutique for her fall 2015 presentation. It was such a treat getting to meet her in person, and get acquainted with the new styles and designs for fall. As if it couldn’t get better, she offered to lend me a piece to wear throughout fashion week! Obviously I took her up on it. Seeing as I’m focused on neutrals and keeping it classic, I chose this style that I’ve been eyeing since day one. The Herzog clutch is Khirma’s original, signature style. Modern, versatile and incredibly luxe. Since I didn’t photograph any of my outfits at fashion week, I brought it home with me to shoot with a couple looks before sending it back. Let’s just say I’ve been pairing this clutch with everything and it’s the next item on my must-purchase list. Chic! A few other styles you’ve gotta check out: this mint + grey stingray bucket bag for spring, the perfect evening bag, and this crocodile tote. I really love your cuff and the bag! stunning clutch and your jeans fit like a dream. Love them! 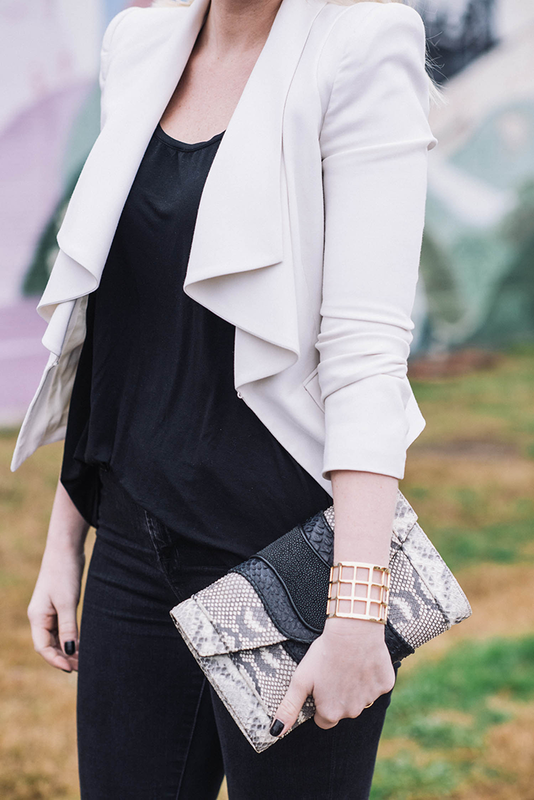 Love this look, especially that clutch, LOVE LOVE LOVE! such a beautiful clutch, and I’m loving those skinnys. Perfect fit! You look so classy and gorgeous as usual! That clutch! Looking chic, as always! I’ve never heard of that brand before but am dying to check it out now! That clutch is SO good! Love the earrings too :) you have such great taste in unique accessories! I have been DYING to get one of her clutches for a couple of years now and have yet to pull the trigger! I love the one you are modeling. It is such a beautiful, neutral color palette and combines such amazing textures. You may have finally convinced me to make the purchase! Gorgeous! I just pinned this. Obsessed. Such a wonderful statement piece! I love love love all her clutches- the textures and colors she does is unreal! I love the jewels you’re wearing here too! Those jeans are a dream! I’ve always been a fan of J Brand. Love this outfit and the dainty jewelry! That is a nice clutch. I like the blazer too. You look great ! What a beautiful clutch. It looks so well made! I am definitely checking out her other bags! Perfection Merritt! 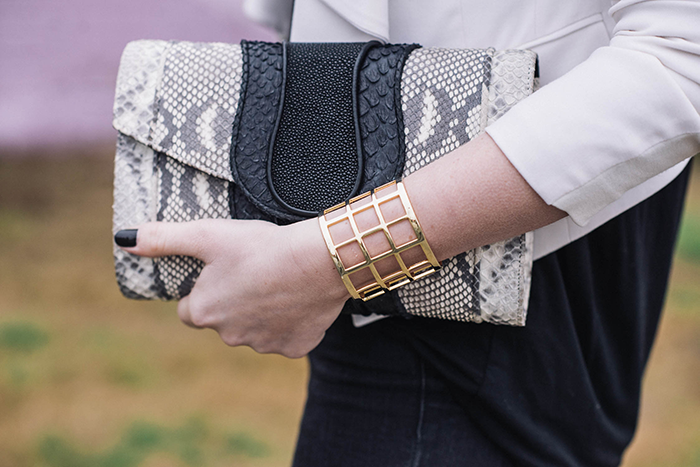 Love that clutch, so luxe and perfect for all seasons. That clutch is amazing! I love the mix of different colors and textures! i love that bracelet! super chic outfit! I’ve never heard of the brand before, but I’m definitely going to check it out! The designs are beautiful. Thanks for sharing! Cute outfit and I adore that clutch. Love the way your styled this outfit! I really love that the clutch has a mixture of textures and patterns, so it could go with so many outfits!